“Faith in Christ?” I took an involuntary breath. Did you mean to say that Prime Minister? It sounds so, well, faithy. She does mean it, and if Mrs May finds some way to put those words into action then it’ll do all of us good. Well, not quite all of us (screeches the National Secular Society), but it would indeed do a lot of people a lot of good if the Prime Minister could find some way of putting her words into action, which politicians tend not to do when the going gets tough. In this case, it’s ‘s a pretty big ‘if’, not least because it would involve a bit of rowing back on equality and a bit of re-balancing of human rights: it would require a pretty strong assertion of ‘reasonable accommodation‘ for Christians once again to be free to speak publicly about their faith in Christ. “I am delighted in particular that we have here with us today people from all parts of the church and the United Kingdom – including the Black Majority Churches, the Network Churches, Parliament’s own Church, St Margaret’s Westminster, and church leaders such as Cardinal Vincent Nichols, Archbishop Sentamu, and the Bishop of London, Richard Chartres, who is standing down after more than 20 years. “Can I just say, Richard has been one of the great leaders of the Christian faith in our country – he is not just someone with an extraordinary presence and richness of thought who has in twenty years almost doubled church membership in his diocese and established over 30 new churches. “I am sure you will join with me in paying tribute to his outstanding leadership and service – and wishing him well in the years ahead. And the wine flowed, the strawberry pancake canapés were scoffed (it was Shove Tuesday, after all), and everybody smiled and smiled. But while they were listening to the Prime Minister talk about sacrifice, service and ministry; while she lauded those who comfort the sick, feed the starving, weep with the bereaved, and volunteer as aid workers in war-torn parts of the world; while she spoke of celebrating the role of Christianity in our country; of our “very strong tradition” of religious tolerance and freedom of speech, two street preachers were being convicted of a public order offence in Bristol Magistrates’ Court. During the four-day trial, prosecutor Ian Jackson said: “To say to someone that Jesus is the only God is not a matter of truth. To the extent that they are saying that the only way to God is through Jesus, that cannot be a truth.” And it seems that if you believe it to be a truth and you proclaim it as truth, you may be found guilty under Section 31 of the Crime and Disorder Act 1998, for using “threatening or abusive words or behaviour or disorderly behaviour within the hearing or sight of a person likely to be caused harassment, alarm or distress”. Mention Jesus (the thorny naily one), and the offence becomes religiously aggravated. 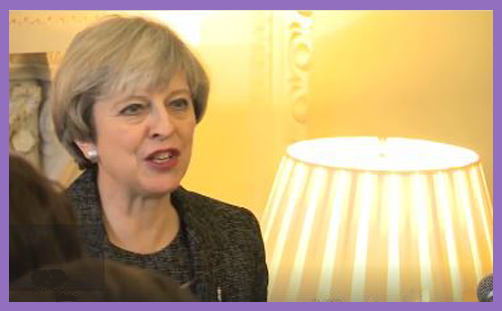 “We must reaffirm our determination to stand up for the freedom of people of all religions to practise their beliefs in peace and safety,” said Theresa May. “And I hope to take further measures as a government to support this,” she added, tantalisingly. Faith in Christ is offensive to those who are being lost. Preaching the cross is a stumbling block to Jews and foolishness to Greeks (1Cor 1:23). Is it offensive to point that out? Isn’t it a bit (shh..) ‘racist’? If it is a breach of Section 31 of the Public Order Act 1998 to preach it in the public square, isn’t it a breach of Section 127 of the Communications Act 2003 to blog about it?